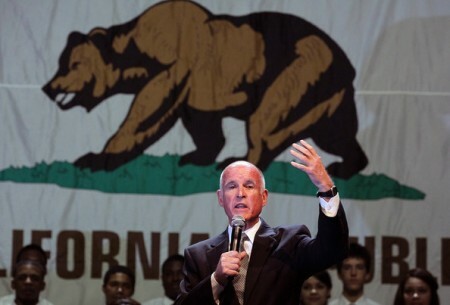 New California Governor Jerry Brown: Unions’ Friend or Foe? California public employees unions enjoyed a moment of victory Monday as Jerry Brown took office as governor, a position he last held almost three decades ago. In contrast to outgoing Republican Gov. Arnold Schwarzenegger, who made national headlines for brutal battles with union nurses, teachers and firefighters, unions campaigned heavily for Brown. It was an absolute no-contest as far as unions were concerned; Brown’s opponent was former Silicon Valley CEO Meg Whitman, who showed her feelings toward low-wage workers by calling immigration officials on her undocumented housekeeper. The California Federation of Labor intensified its get-out-the-vote campaign for the gubernatorial election; Whitman’s spokesman decried public union spending, about $25 million on the election. Union members said they were just trying to counter the $104 million Whitman spent on her own campaign. The big question now is: How will Brown deal with public employees unions in the face of a crushing budget deficit which Republicans and others have blamed largely on supposed cushy contracts enjoyed by these employees. TV news channel KUSI described a campaign trail event where Brown and his wife tried to walk a fine line, shaking hands with union members at a hot dog cookout but ignoring the podium and microphone they had ready for him, eliciting boo’s from attendees. In the days since the election Brown has warned of impending cuts, including to public programs and agencies. In response, teachers unions — which critics say are in bed with Brown — have called for raising property taxes or other measures. Brown meanwhile has talked of creating half a million “green” jobs, (presumably predominantly private sector but unionized or well-paid), an idea met with significant skepticism. He will probably ask voters in a special election to raise taxes. The real question is what will he do about the public employee unions, their growing labor contracts and their swelling pension demands? There are very few who believe Jerry Brown can and will stand up to the unions and if he does not, there is not much chance to solve the states’ “outyear” budget problems. Conservative blogger Dwight L. Schwab Jr. lambasted Brown for kowtowing to SEIU for political points, negotiating what he calls exorbitant public employees salaries which the cash-strapped state can hardly afford. While California public employees have doubtless received significantly more generous pay and pensions over the years than most private employees and other states’ public employees in similar positions, union members balk at the idea that they are single-handedly to blame for a budget deficit that has also been impacted by everything from the Enron debacle to generous corporate welfare to the economic crisis caused largely by Wall Street and subprime lending malfeasance. It’s not like the State workers have asked for pay raises across the board. The majority of us haven’t had a pay raise in years and the 15% cut I and the other 200,000 workers took last year didn’t even pay the interest on the deficit the State has. The majority of us know the deficit, in fact we know the problems intimately well but aren’t being listened to. In all, 82 full-time employees doubled their annual salaries with overtime at least once during Brown’s time as mayor, city payroll records show. Twenty-one employees took home more than $100,000 in overtime in a single year; 333 earned more than $50,000 in overtime in single year. Of the roughly 4,000 city employees making at least $20,000 in base pay, 681 increased their annual salaries by 50% or more with overtime in at least one year of Brown’s tenure. Sooner or later we will have to face the financial mess that the public employee unions have wrought on California. And we have Moonbeam to thank for making this mess. Any of you who are not working 6-day weeks and 12- hour days owe a big debt to the union movement. But you would have to understand history to know that. Meanwhile other labor activists said Brown was hardly a real friend of workers, describing his support of Oakland police attacking longshore workers and privatization of education and other services. Heyman noted that Brown “gave the green light’ for Oakland police to brutally attack longshoremen and other picketers at an anti-war protest on the docks in 2003.